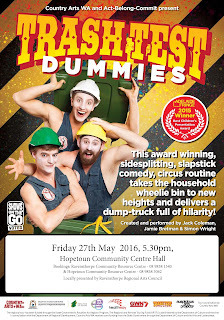 Hold on to your Wheelie Bins every body, there's a terrific trio rolling in to Hopetoun in less that a fortnight!! Currently on their Regional Tour of WA, highly skilled circus performers Jamie Bretman, Isaac Salter and Simon Wright will be welcomed by the Ravensthorpe Regional Arts Council on Friday 27th May 2016. This slapstick comedy is cleverly put together so that different levels of comedy appeals to all ages. The circus performers are as full of laughs as their bins are full of surprises. 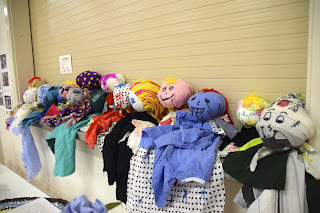 The Hopetoun Primary School P&C will be selling tucker before (snacks & drinks) and after (dinner) the show, so bring a bit of extra cash and support this fundraiser as all proceeds go to the P&C. Tickets are available now from the Ravensthorpe CRC (credit cards accepted), and the Hopetoun CRC. RRAC is offering a free Circus Workshop on Saturday 29th May for 7 - 12 year olds. Limited places are available, so get your tickets quick to register your interest for the workshop. The Trash Test Dummies are an award winning team, and very soon they are going to rock your socks off!